First and foremost, the Oneida Dust Deputy works as advertised. 99% of the all dust sucked into the Deputy end up in the Deputy's bucket. The filter of the shop vac stays cleaner longer. In fact, in my shop I have reduced my filter cleanings by a factor of about 7x. The deputy's bucket still has to be emptied, but unlike the shop vac it can be filled to the top, and the vac does not loose suction on the way there. As far as build quality is concerned, there are no issues. The plastic cyclonic separator has no moving parts. It's unlikely to break during operation. Just about the only way to destroy the deputy is mechanical impact. It's possible to break the base plate off, if you really try. The Dust Deputy gets an A in build quality. The connection point of the shop vac to the Dust Deputy is the most likely point of failure. I can already see that my shop vac's drum, which is made of plastic, will tear sooner or later. It was not engineered to support the weight of the Dust Deputy. 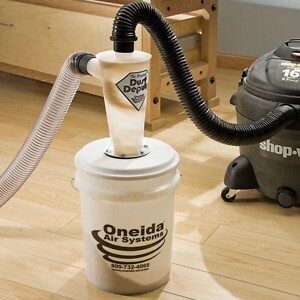 The performance of the virtually empty shop vac Oneida is showing off in this promotional video is close to the truth (the collection ratio does drop a bit when very fine dust is vacuumed up). The Dust Deputy requires the use of bags in the collection bucket. If a bag is not used, the only way to empty the bucket is to turn the entire shop vac along with the Dust Deputy upside down. This is more on observation rather than a limitation of the Dust Deputy. For me the choice of whether or not the Dusty Deputy has a place in your shop comes down to two criteria: size and expected usage. The Dust Deputy is bolted to an existing shop vac. This effectively doubles the size of the shop vac. In the video you can see that the Deputy has a wheel on the bottom. Without it the vac would keep tipping over. It's that large. While the dusty Deputy is still a portable machine, it is also a very large machine. You have to decide, if you can use a unit that is twice as large as your current shop vac? In other words; would you carry two shop vacs to the jobs site? The answer is totally subjective. In an open shop with level floors, the Dust Deputy is a great asset. The second consideration is the suction power of the unit. The Dust Deputy itself has no motor. The performance of the unit is entirely determined by the shop vac's power. You should expect to lose a little bit of suction power when the Dust Deputy is attached to your shop vac. This is cause by the extra resistance the collector and additional pipe adds to the air path. Because of this resistance I recommend that you install the Deputy only on shop vacuums that are plenty strong enough to begin with. Entry level shop vacuums barely function properly. The Dusty Deputy would render a unit like that unusable. Even when paired with the best shop vac, the Dust Deputy is not a substitute for a stationary dust collection system. A shop vac with only a 2 inch pipe simply cannot pull enough air to adequately support moderate dust producers such as a table saw. It's simply impossible. Bill Pentz makes this point on his well-researched webpage. Anything smaller than a 4 inch pipe cannot be considered adequate dust collection. That being said, the Dust Deputy has its place. It's plenty strong enough to support most hand held power tools. It also makes for a great floor vacuum. In a pinch it will collect a good portion of the dust created by stationary machine. Just be aware that it won't collect what the experts call "adequate". Overall the Dust Deputy is a great buy, if you plan on using it mostly in your shop. It will support power tools very well, but will start to struggle when used with stationary tools. The Dusty Deputy is not a dust collector replacement. It is, however, a very innovative tool that has the potential to greatly speed up your vac tasks around the shop.